At least I do. Quite often, even. And one article in particular, that I find utterly brilliant and interesting, is “Legends of Karate: Mabuni Kenwa and his Shitô-Ryû”, written by my friend Matthias Golinski, from Germany (which first appeared in ‘Classical Fighting Arts’). Envying my “enthusiasm” for Karate (or fearing all the vicious ground n’ pound I laid down on him a couple of years ago! ), Matthias agreed to make an exclusive, über awesome, exception this time. Can you believe it? “Legends of Karate: Mabuni Kenwa and his Shitô-Ryû”, which in my opinion should be entitled “How Mabuni Kenwa Totally Owned The World of Karate And Like, By The Way, Created Shotokan In The Process” freshly e-mailed to me all the way from the Kingdom of Sausages, for your exclusive reading pleasure. Suffice to say, articles like these are often very expensive (like, you would have to buy an actual book to read it. Yes, those big heavy things. No, not an iPad), and you would have to be quite interested in history (=Karate nerd) to thoroughly enjoy it. Oh, and sorry guys, but I couldn’t keep all of the original sources, footnotes and stuff intact (there were like thousands of them! ), but believe me, everything here is 110% accurate as verified by the International World Global Official Very Serious And Important Real Sokeship Council of the Gods et al. Just e-mail me if you have questions, as always. Mabuni Kenwa was born on November the 14th, 1889 (Meiji 22) in Shuri on Okinawa. His father, Kenpô, worked as a confectionery salesman in Shuri, and was the 16th offspring of the Oni Ôgusuku, an Okinawan aristocratic family (Keimochi). During the Ryûkyû Kingdom, he wore the honorary title of ‘Peichin’. Kenpô and his wife decided to name their second son ‘Kenwa’ (the wise and harmonic). As a child, Mabuni was quite weak and susceptible to illness. At the early age of ten years, a servant apparently introduced him into the art of Karate for the first time. Three years later, at the age of 13, on the recommendation of his father, Mabuni started his training with the secretary and renowned Karate-master Itosu Ankô (1832-1915), the “holy fist of Shuri-Te”. Mabuni was very enthusiastic about Itosu’s training and did not miss any lesson until his twentieth birthday. The training with Itosu was quite intense and over the years, Mabuni learned all 23 Kata of Itosu’s system. During his time at ‘Okinawa’s Prefectual First Middle School’ (Okinawa Kenritsu Daiichi Chûgakkô), Mabuni trained also with Hanashiro Chômo (1869-1945), one of Itosu’s top-students. In 1909 (Meiji 42) Itosu told Mabuni to expand his knowledge with other teachers. Mabuni knew Miyagi Chôjun (1888-1953) already from school and knew him to be a Karate-student of Higashionna Kanryô (1853-1916). Finally, Miyagi made the contact in between the two and Higashionna accepted Mabuni as a student. From that moment on and for the following two years, Mabuni trained parallel with Itosu and Higashionna. Higashionna taught Mabuni the Naha-Te and Mabuni returned the favour with an outstanding showing of dedication. In 1907 (Meiji 40) Mabuni began to work as a substitute teacher at an elementary school in Naha. Two years later he was drafted into military service in Kumamoto. This experience should have induced him to start an apprenticeship at the local Police Academy in 1912 (Meiji 45/ Taishô 1). There Mabuni was also taught some Kendô and Jûdô. After he passed, he became a Police Inspector in Naha in 1915 (Taishô 4). It was the same year that his long-lived teacher Itosu Ankô died. To pay homage to his teacher, Mabuni practiced Kata at Itosu’s grave on a daily basis for an entire year. During this time Mabuni also started his training with Aragaki Seishô Tsuji Peichin (1837 or 40-1918 or 20) from Kume Village. Aragaki, who was because of his agility also called ‘Mayô’ (the cat), taught the Southern-Chinese style of Monkfist-Boxing (Chin. : Luohan Quan). He had already taught Mabuni’s teacher Higashionna, as well as Miyagi Chôjun and Funakoshi Gichin (1868-1957) in the martial arts. Aragaki taught Mabuni his versions of Unsu, Sôchin and Niseishi Kata. Another important influence on Mabuni during these days had the Chinese tea-merchant and Quanfa-expert Wu Xiangui (1886-1940, Jap. : Go Kenki). He introduced Mabuni to the style of White Crane Boxing (Chin. : Baihe Quan) and taught him the three Kata Nepai, Happoren and Hakutsuru. In 1918 (Taishô 7), at just 29 years, Mabuni was already a highly regarded and respected member of the Okinawan martial arts community and about to enter one of the most pivotal years of his life. On February 13th Mabuni’s first son, Kenei, was born and Mabuni decided to found the ’Karate Kenkyûkai’. 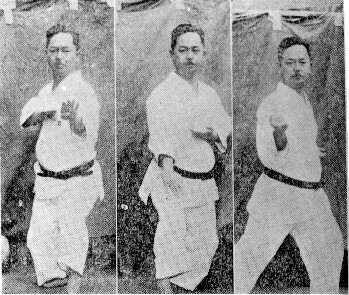 This ‘Society for the Research on the Chinese Hand’ was considered something quite unique in those days and had a considerable amount of first-class Karate-masters as members. In 1924 (Taishô 13) Mabuni accepted several teaching positions and taught Karate inter alia at the ‘Okinawan Prefectual Teachers College’ (Okinawa-ken Shihan Gakkô), the ‘Fisheries College’ (Kenritsu Suisan Gakkô) and the ‘Police Academy’ (Keisatsu Gakkô). A year later Mabuni opened his first Dôjô in the backyard of his house and founded the ‘Chinese Hand Research Club‘ (Karate Kenkyû Kurabu). Following that, he closed the now needless ’Karate Kenkyûkai’. We can guess that the members of the ‘Karate Kenkyû Kurabu’ also taught regularly in Mabuni’s Dôjô and thus that they had an agile technical and philosophical exchange. “Everybody knew that the Mabuni house was a mecca for Karate-Dô men” remembered his son Kenei. “Really, the elite of modern Karate” gathered there. This conversation most likely acted as the catalyst for Mabuni to relocate to Tôkyô in 1928 (Shôwa 3). For the following ten months, Mabuni lived at the home of Konishi Yasuhiro Tenshin (1893-1983), a student of Funakoshi Gichin. Konishi was an accounted expert of the Japanese martial arts and at that time already skilled in Kendô, Musô-Ryû Jûjutsu and Takenouchi-Ryû Jûjutsu. He had also trained Karate with Funakoshi Gichin and should later on become one of the most important figures in the development and spread of Karate on the Japanese mainland. Mabuni and Konishi shared a great passion for the martial arts and must have liked each other right from the start. 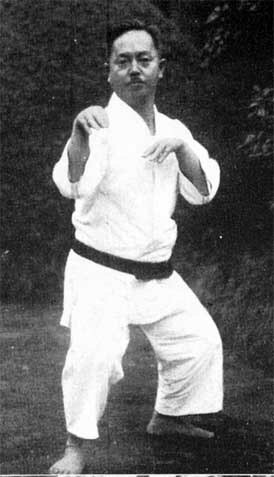 Mabuni taught Konishi evidently various Kata in those days. Although not proven yet, we can assume that Konishi then introduced Mabuni to the basic techniques of Musô- or Takenouchi-Ryû in return. Konishi also frequently joined Mabuni to Karate-demonstrations and even travelled with him to Wakayama-Prefecture to train with Uechi Kanbun (1877-1948), the founder of Uechi-Ryû. Under the impression of this experience, Mabuni and Konishi developed the Kata ‘Shinpa’ which encompassed the defensive principles learned from Uechi. Out of respect for Funakoshi, Mabuni moved to Ôsaka in 1929 (Shôwa 4) and completely devoted himself to his wish to spread Karate all over the country. He followed the approach of his countrymen Funakoshi Gichin and started to teach Karate independently at various universities (Kansai, Doshisha) and police academies. The ‘Club of the Chinese Hand of the Kansai-University’ (Kansai Daigaku Karatebu) was founded in May 1930 (Shôwa 5) and Mabuni started to teach there. 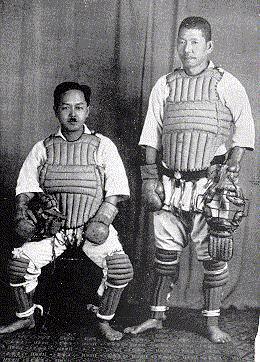 Later on he was supported by his companion and teacher Wu Xiangui (Go Kenki). Other teaching places that followed, included, the ‘Higher Pharmaceutical Technical College Ôsaka’ (Ôsaka Kôtô Yakugaku Senmon Gakkô) and the ‘Higher Medical Technical School Ôsaka’ (Ôsaka Kôtô Igaku Senmon Gakkô). In 1934 (Shôwa 9) Mabuni finally opened his first own Dôjô in Japan, the ‘Yôshûkan’ (‘House of Proper Education’). His first student in these days was Sawayama Masaru (1907-1977), the later founder of Nihon-Kempô. Uechi Kanei must have followed shortly after [Jesse’s note: No, not that Uechi. See ‘Okinawan Karate: Teachers, Styles and Secret Techniques by Mark Bishop’ for more.]. During the mid 1930’s Mabuni gave greater focus to his own development and trained almost daily together with Konishi, Ôtsuka Hironori (1892-1982), the founder of Wadô-Ryû Karate and Ueshiba Morihei (1883-1969), the founder of Aikidô. At the time there already were various styles of Karate on the mainland and the ‘Great-Japanese Society for Martial Virtues’ (Dai Nihon Butokukai) wanted the different schools to separate from each other. Mabuni first decided to name his kind of Karate as ’Hanko-Ryû’ (Half-hard-style). But out of respect for his two main teachers, he decided to change the name to ‘Shitô-Ryû’. This term derives from the Sino-Japanese reading of the first Kanji of the names Itosu and Higashionna. In 1939 (Shôwa 14) the ’Dai Nihon Butokukai’ registered the name whilst also awarding Mabuni the title of a ’Karate Grandmaster’ (Karate-jutsu Renshi). Like the rest of Japan, the Second-World-War highly afflicted the still young Shitô-Ryû-community. Many of Mabuni’s students died or were severely wounded. Mabuni survived the war, but lost most of his property. His former students gathered bit by bit at their old training place and continued their practice. To be continued… we’re just warming up, people! Why were the masters of Budo so willing to visit and train with other masters to exchange ideas? Yet people today appear incapable of doing this? I totally agree with your comment... It's incomprehensible. Maybe it is caused by the introduction of the competitiveness: masters are afraid to share their knowledge, because they could give an advantage to their competitors. I think it is really sad and primitive: exchange ideas can only improve the knowledge and reduce the imperfection of all the contributors. “Legends of Karate: Mabuni Kenwa and his Shitô-Ryû”, which in my opinion should be entitled “How Mabuni Kenwa Totally Owned The World of Karate And Like, By The Way, Created Shotokan In The Process”+1high-five! Great article because i love shito ryu( and yes also other styles)for karateka who like 2 read try this book EMPTY HAND the essence of budo karate by KENEI MABUNI. I read it in French and I can recommend this wonderful book!